A Raspberry Pi is a small computer that uses an ARM 11 processor running at 700MHz with 512MB RAM. Setting up a Raspberry Pi as a home web server is a great way to learn about web design and server administration. 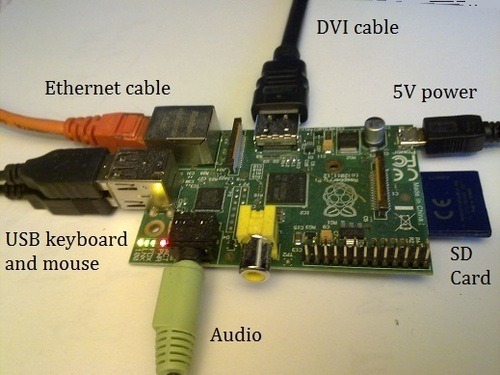 A Raspberry Pi uses much less power than a PC, and takes up much less space. The fully featured Linux operating system comes with lots of software, including the Apache web server which is used to host some of the world's biggest web sites. CSS - Cascading Style Sheets This article is about using CSS with HTML. Making a complete HTML page Coding a complete HTML page on a Raspberry Pi. HTML Basics Learn how to write basic HTML on a Raspberry Pi. Bash basics Learning how to use the Linux command line is extremely useful. Almost every aspect of the Linux operating system can be accessed from the command line. Comparing the performance of Nginx and Apache web servers I've done a side-by-side comparison of Apache and Nginx to see which is the best choice for my web site. Setting up Nginx and uWSGI for CGI scripting Nginx is an open source web server that's designed to handle heavy traffic efficiently and quickly. It's lightweight, so it's perfect for use with a Raspberry Pi. Building a remote control vehicle using a Raspberry Pi See how to control a a model tank with a Raspberry Pi. A simple example of web programming. Using MySQL on a Raspberry Pi MySQL is a sophisticated database that scales easily for larger applications. This tutorial is an introduction to using MySQL on a Raspberry Pi. Building a web user interface for the temperature monitor Learn how to build a web UI in Python. This tutorial shows how I built a web UI for the SQLite temperature logger on my Raspberry Pi. Connect your Raspberry Pi to a USB hard disk Learn how to configure your Raspberry Pi. Connect a USB hard disk to your Raspberry Pi. Building an SQLite temperature logger Learn how to build an SQLite based temperature logging system written in Python. This system uses a DS18B20 temperature sensor to take readings every 15 minutes, and it displays them on a web page. A Raspberry Pi is a small single board computer with the kind of processor that you'd normally find in a smart phone. It's just about powerful enough to run a desktop version of Linux. It can be used as a media server and you can also use its General Purpose Input Output (GPIO) pins to interact with your own circuits. 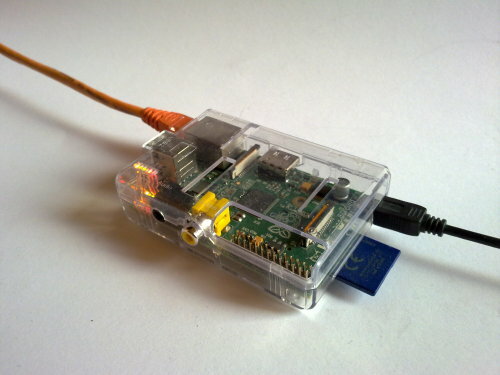 I'm using my Raspberry Pi to find out how much traffic a miniature webserver can handle. I started with the Raspberry Pi Model B Board and starter kit and set it up as described in the Raspberry Pi User Guide. You can get the Raspberry Pi as a kit with a USB wifi dongle, keyboard and mouse, or on its own if you already have a mouse and keyboard. I configured my Pi to run at 800MHz instead of the default 700MHz. I installed the Apache web server, and copied some web pages to Apache's root directory. My Pi is connected to my router with an ethernet cable as this will provide better performance than a wifi connection. Next, I set up port forwarding in my router so that people can connect to my Raspberry Pi from outside of my firewall. I created an account with no-ip.com, a service which redirects a web domain to my IP address. I've set up a blog where I'll go into more detail here. The Raspberry Pi's General Purpose IO Pins (GPIO) can be used to read data from sensors and send control signals to motors, lights or any circuit you can dream up. The PiFace interface board makes it much easier to connect things like motors to your Raspberry Pi without damaging it. You can write your own programs in Python or C to control devices connected to the PiFace board. The wiringPi software library makes it easy to control and debug the GPIO pins. The table below is generated using the 'gpio readall' command.